Four women gather to drink wine and share confidences. Meeting periodically, they share share films, personal triumphs and heartbreak. Although women are independent and strong, they will always support one another. 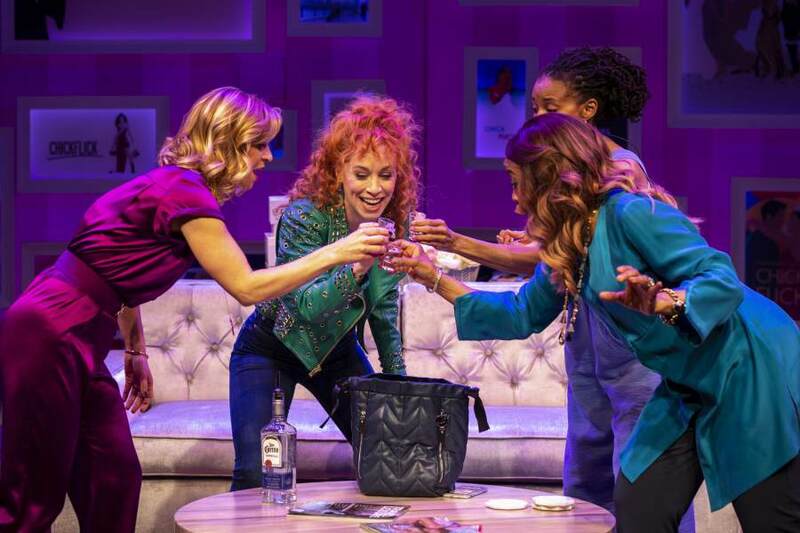 This clichéd premise epitomizes the Off- Broadway musical "Chick Flick." The best elements of the show are the movie references. The women play a game as they liberally sprinkle famous movie lines into their conversations. Who can identify the quote soonest? (I got some of them!) In one of the best songs, the three women refer to movies when they have to make decisions. They sing “WWMD“ (What would Meryl Streep do? as they discuss her movies. Another creative aspect is the assorted (60 or more) movie posters which decorated the curtain around the stage. Derived from famous posters but without the names of the moves and the actors, most of the movies were clearly recognizable. It was fun naming movies including “Pretty Woman,” “Fried Green Tomatoes” and “Kramer vs. Kramer,” among others. There are classic movies that audiences watch over and over again. We love the characters, boo at their adversaries, and cheer for their triumphs. Sadly, we don’t feel that way with the women in “Chick Flick.” They drink and sing and when the show concludes, we are ready to go home and watch our favorite movie. Chick Flick the Musical played at the Westside Theatre.